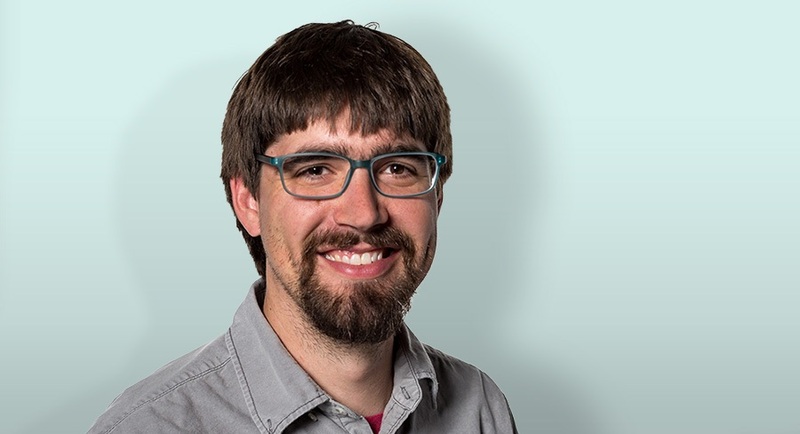 I'm Matt Lero, and I’m an architect at RDM Architecture in Kansas City. What has it been like working at RDM? It's a team sport here, so we all know what's going on in every project. You get to take a project and follow it all the way through. There isn’t somebody doing construction documents, somebody doing field work, and so on. It's everybody doing everything. That part is really great. Do you have a favorite part of the project process? I really like the beginning of the process—the schematic design part, and the refining of it. The construction documents are not as much fun for me, but that's where the really detailed stuff comes in, and some of that I really enjoy. I've also been involved in a lot of our website, marketing, and social media efforts. For a while, we weren't really doing much of that. 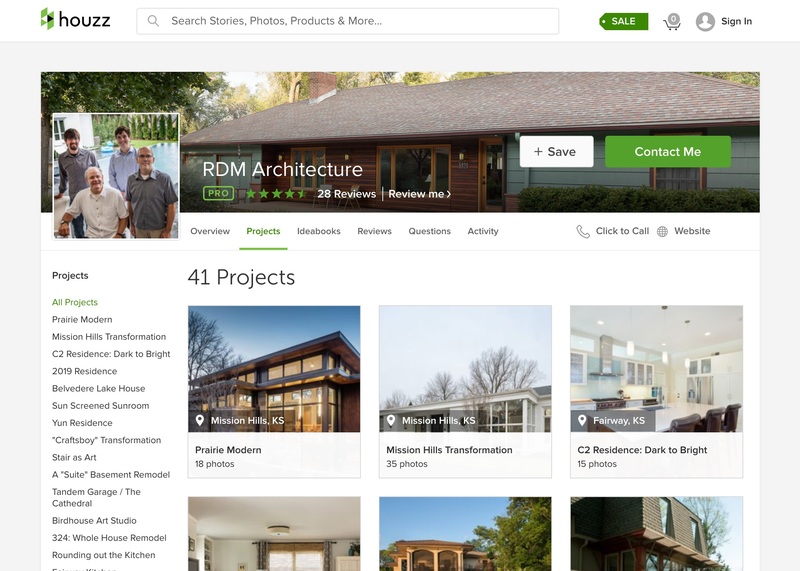 I came across Houzz not that long after I started at RDM. Houzz had just started, and I just uploaded a bunch of photos, and then didn't do anything with it for about a year and a half. After that, we invested more time into our profile, and almost immediately started getting work from it. We basically just put a lot of content in place, checked all the necessary boxes, and got a pretty high search ranking within their platform. The more often we added projects and content, and the more responsive we were to requests, the higher we ranked in their system. Then, Houzz approached us about joining their Pro program, and we said we’d give it a shot. After that, we were getting like twice the number of hits, because they gave us a sponsored listing on top of our already high organic ranking. So it has been really good for us! Have you also put effort into ranking higher with Google? Yeah. 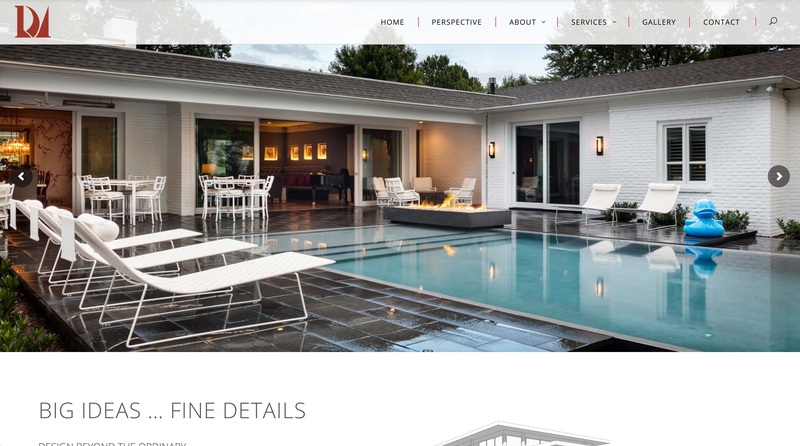 While we were working with Houzz, we were also writing a lot of content and developed a new website. Those things in combination gave our website a pretty high rank on Google, just because of the work we were putting in. We managed to keep up our Google rank just by adding more content to our website. Writing a lot of content helped RDM rank well on Google – rdmarchitecture.com. What do you feel like the biggest factor is for you in ranking high? Did you get outside help? Our website consultant gave us some tips for SEO—keeping an eye on our content, keeping keywords in there, and then some back-end work too. But for the most part, it has just been about adding a lot of content. It’s also been about just getting into the habit of doing it, which is tough—especially when you're busy. We first started this around 2008–2009, when architecturally it was like the apocalypse. There was just no work. So we had a lot of time to focus on marketing, and it paid off big time. We first started this around 2008–2009, when architecturally it was like the apocalypse. There was just no work. So we had a lot of time to focus on marketing, and it paid off big time. Besides search, have you invested in any other marketing efforts? Well, a lot of our bigger projects have happened through sort of random connections: somebody knows somebody who knows somebody. That's why we go back and forth about marketing in our office. We do some print advertising, too, but that can feel like you’re just sort of shouting out there, and it's not really trackable. Is there anything that you do proactively to cultivate referrals? Or is it just an organic process? It's kind of both. We just finished a residential project in Mission Hills—a big contemporary house. We had done a little project for them back in 2009 that went really well. The key is just keeping those relationships going. The Mission Hills house was on the AIA homes tour, and that was really beneficial. We got some buzz out of that, and then got some new business leads. Also, when you do a project, you have this significant connection with the client. Then when somebody compliments them on their house, they feel like they were part of the process, and they're proud of it. That’s where referrals really come into play. Is it safe to say that your clients will even do some “marketing” for you? Yeah, and some people have really gone way out of their way. We did a house on Aberdeen where the client let us have two tours. Around a thousand people came through, and then on another tour, 7,000 people went through the house—in two days. That’s a huge deal in terms of disrupting your everyday life. And that's the relationship we hope to have: where people are proud of the work we do for them, and they want to show it off. And that's the relationship we hope to have: where people are proud of the work we do for them, and they want to show it off. What would you say is your biggest challenge related to business development and marketing? The biggest challenge is just finding the time to do it. We don't have a dedicated marketing person. And, when you're busy, you don't have time to do the marketing... but that's when you need to be doing marketing! When you're not busy, it's too late to do it. So what we're trying to do is get into the habit of doing it, and create a system where everybody in the office is involved. Having it fall on one person is just too much. Where do you plan to focus in the future? Marketing is sometimes a weird thing. We've had big projects where people just did a Google search for Architects Kansas City and found us. Sometimes it feels like you spend all this time and energy on marketing, and then people just randomly find you. We’re just trying to figure it out. I don't feel like we have a complete handle on it. I think we're still figuring out the balance between cultivating those face-to-face relationships and doing active marketing through digital platforms. We’ve gotten some cool projects through both.